This pipe heating cable is self-regulating and tells you when it is working. 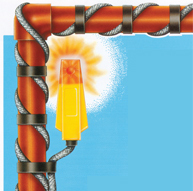 Wrap-On Pipe-Guard™ cable with Performance Monitor Technology has a lighted end cap that indicates the cable is operating. There’s no need to crawl into a cold, dark crawl space or under a mobile home to check your cable. Just look for the light. You only need a screwdriver and wire cutters for installation. 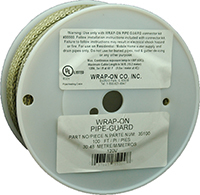 Pipe-Guard cable gives you the flexibility to handle any installation requiring up to 50 feet of cable. Simply cut the length of cable needed from our handy reel, add the Pipe-Guard plug and lighted end cap and install. The self-regulating design reacts to changes in temperature along the entire length of the cable, generating just the right amount of heat needed in each spot. 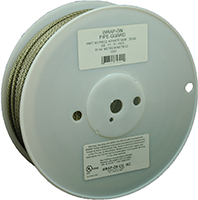 Pipe-Guard™ cable is rated at 3 watts per foot at 40ºF (9.8 watts per meter at 4ºC). 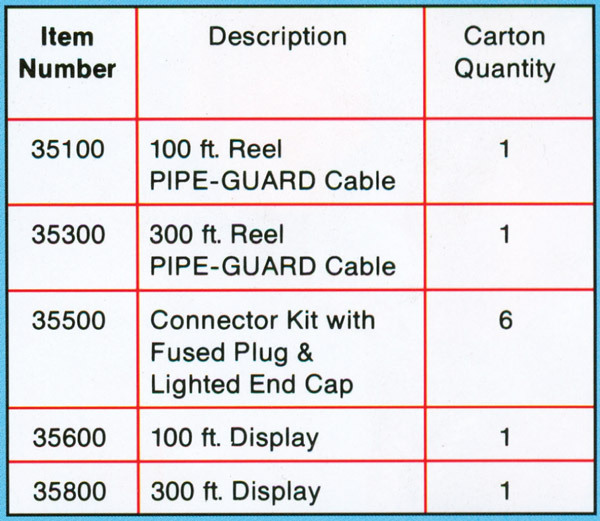 Item #35500 is the Connector Kit for the Pipe Guard Cable which will indicate when the cable is operating.